Life is busy enough without worrying about your checking account. Hawaii State FCU checking options help you achieve financial happiness with no monthly fees when you meet some simple qualifications. Avoid the $5 monthly service fee with eStatements, direct deposit, or if you are age 55+. Avoid the $5 monthly service fee with at least 20 debit card purchases a month or a minimum average daily balance of $1,000. 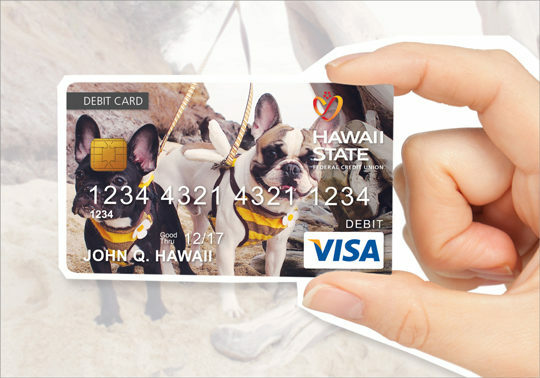 Show off your favorite photo every time you use your Hawaii State FCU Visa® Debit Card. Simply add an image and share your unique personality. 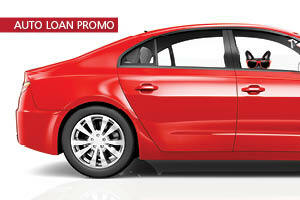 I have checking, savings, auto and personal loans through Hawaii State FCU and I’ve been happy with all of my services. The service is quick and I don’t have to stand in line for too long. No matter what teller I go to, they are always very friendly. * The Annual Percentage Yield (APY) may change after the account is opened. APYs are effective as of 4/1/2019, and may change at any time without notice. Fees may reduce earnings. See Consumer Truth-in-Savings Non-Term Disclosure for more information. * An additional Relationship Bonus may also apply. Please see our Consumer Truth-in-Savings Non-Term Disclosure for more information regarding the Relationship Bonus. ** The Investment Share Account, Relationship Max Share and the Relationship Checking Account are tiered rate accounts. To determine the APY that will apply to your account, refer to the appropriate tier that applies to your account average daily balance for the month. When a particular average daily balance range is met, the APY will apply to the full balance in that account. *** The Annual Percentage Yield (APY) may change after the account is opened. APYs are effective as of 4/1/2019, and may change at any time without notice. Fees may reduce earnings. Our Visa® Debit Card with ATM access is accepted at millions of locations. No fees or service charges when making purchases (provided sufficient available funds are in your checking account). View your transactions at any time via Online Banking or Hawaii State FCU Mobile App. Pay where Apple Pay, Samsung Pay and Google Pay are accepted. Withdraw from more than 1,000 ATMs in Hawaii, and more than 100,000 worldwide displaying the logos found on the back of your card. Click here to locate an ATM near you. Free withdrawals at Bank of Hawaii ATMs throughout Hawaii. Enjoy peace of mind protection with EMV chip security to protect your identity. Shop with greater confidence and safety against unauthorized transactions with Visa® zero-liability protection and Verified by Visa®for enhanced online security. Eliminate sharing of personal information often required when using personal checks. Use Debit Card Controls in the HSFCU Mobile App to turn your debit card on/off and set transaction alerts. Learn to manage, save, invest, borrow and spend wisely, now and in the future. Like any strong family, we support each other and share what we know. Join us for a free educational seminar. Find financial peace of mind with interactive eLearning modules that cover everything, from identity theft to building a budget. Free, confidential counseling is available for you and your immediate family. Follow the Hawaii State FCU Wallet Wisdom blog. Learn tips and tricks to manage your money to improve your financial well-being. Not yet a member? 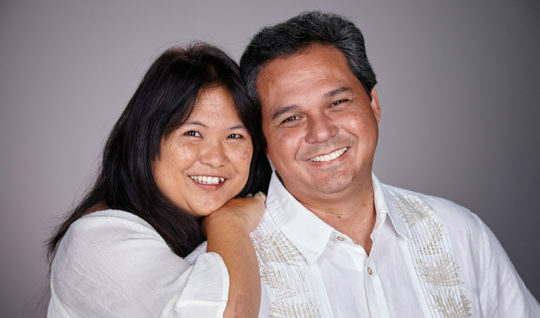 Experience the Hawaii State FCU difference. 1 Please see our Consumer Truth-in-Savings Non-Term Disclosure for more information. 2 The monthly service fee for the Relationship Checking Account is not charged if the primary member has a $25,000 combined balance at the Credit Union. The combined balance is calculated by adding the primary member’s average daily balances during the month for all consumer savings, checking and term share accounts, and the balances at the end of the month for all consumer loans, lines-of-credit, home equity lines of credit (HELOCs) and credit cards in good standing. Accounts must remain open at the end of the month to be included. Mortgages, business accounts and business loans are excluded. The Credit Union may determine the credit card balance on a date prior to the end of the month. Please see our Truth-in-Savings Disclosure for more information regarding the Relationship Checking Account Monthly Service Fee. 3 Please see our Consumer Truth-in-Savings Non-Term Disclosure for more information regarding the Relationship Bonus and Relationship Checking Debit Card Cash Back. Rates are effective 4/1/2019 and are subject to change without notice.